Thank God for another joy and privilege to join in public worship this morning. It is always very refreshing to me, after a busy week, to quiet down and enjoy worship and fellowship. Although I read the Bible and pray daily in my personal devotion, going to church and worship with my church friends is always something I look forward to. This morning I derived much encouragement and instructions from the preaching of God's Words, prayers, singing and Christian fellowship. We sang Psalm 61 which is one of my favourite Psalms, and in particular verses 1 to 4. "God's power and promise are a rock that is higher than we. This rock is Christ; those are safe that are in him. 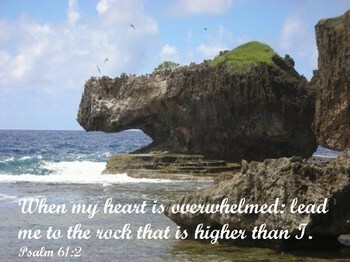 We cannot get upon this rock unless God by his power lead us. I will put thee in the cleft of the rock, Exodus 33:22. We should therefore by faith and prayer put ourselves under the divine management, that we may be taken under the divine protection." At times life becomes overwhelming. Sometimes because it is so busy and full of activities, and at other times because I myself struggles with mood swings ie manic or depression. My body and mind still can't seem to synchronize very well. I have so much I want to do with every waking hours, and then when night comes I feel so drained. At times I began to experience mood swings. Stress and strain seems to have such negative effect on my body and mind. Managing daily tasks and challenges, and at the same time managing mood swings so that they don't escalate into manic episode or plunged into depression episodes, takes much patience and awareness. And for me, much prayers. I am reminded afresh that when life circumstances or my own feelings or mood overwhelmed me, I can go to God in prayers. I can pray that He leads me to the Rock that is higher than I. This Rock is the Lord Jesus Christ. He will guide me through His Words and lead me along the path that I should go, and He will give me strength to face the challenges daily so that I may live for His glory. The challenges in my life draws me nearer to the Lord as I learn to cast my cares upon Him, and experience His love and faithfulness in taking care of me daily. Thank God that when I feel overwhelmed, I can rest in this Rock that is higher than I. I am learning to do so day by day, and it gives me courage to face each new day, with various challenges, knowing the Lord is with me. Thank God! I look forward to this coming week where I can once again look to God for grace and strength, and experience His goodness and mercies in many wonderful ways, as I seek to know Him, love Him and serve Him and others. My friend, HH Sau, took this lovely photo at Saipan. 3 For thou hast been a shelter for me, and strong tower from the enemy. 4 I will abide in thy tabernacle forever: I will trust in the covert of thy wings. Thank you for that dear Nancie. Thankfully we have Christ to cling to. A strong rock that can never be moved. Yes, Michelle, it is such a comfort and encouragement to me as I sojourn in this pilgrim journey. Hope you have a blessed week ahead. Take care.